On 29 January 2019, the Ministry of National Health Services, Regulations and Coordination of Pakistan issued a Notification requiring the use of new pictorial health warning on cigarette packs from 1 June 2019. 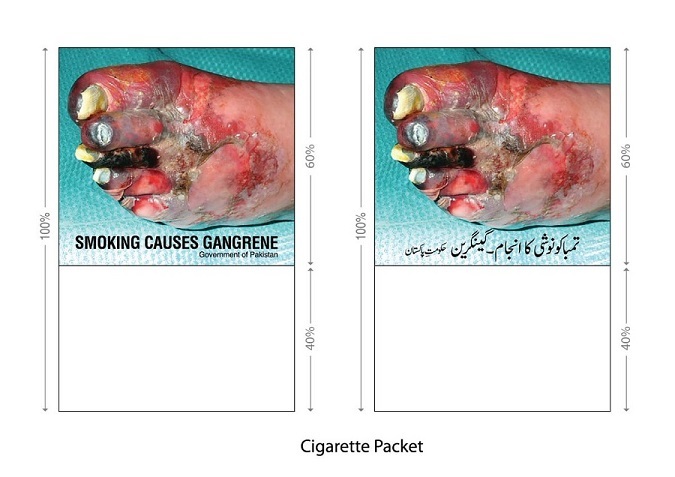 According to the notification, the new warning depicting the disease “Gangrene” will be printed on both sides of cigarette packs and outers, and the size of this new warning will be increased from 50% to 60%. The new warning builds upon previous measures implemented by the country in its fight to reduce tobacco use. These measures include the increase in the size of pictorial health warnings in 2017, the bans on the sale of loose cigarettes sticks, on import of tobacco and non-tobacco sheesha, and on tobacco advertising in print, electronic and outdoor media as well as the 100% smoke-free regulations. The Government of Pakistan continues to be committed to reduce tobacco demand and supply in the country. The implementation of the new pictorial health warning is in line with the requirements of WHO FCTC Article 11 and is expected to discourage cigarette consumption and motivate tobacco cessation. These measures are also in line with the recommendations of the need assessment mission that was carried out jointly by the Government of Pakistan and the Convention Secretariat and its partners. The need assessment report is available at: https://www.who.int/fctc/implementation/needs/who-fctc-na-pakistan-report.pdf?ua=1. For more information please contact Dr. Ziauddin Islam, Director of Tobacco Control Cell via e-mail: ziauddin@tcc.gov.pk. Press release can be found here. Official gazette will be shared soon.